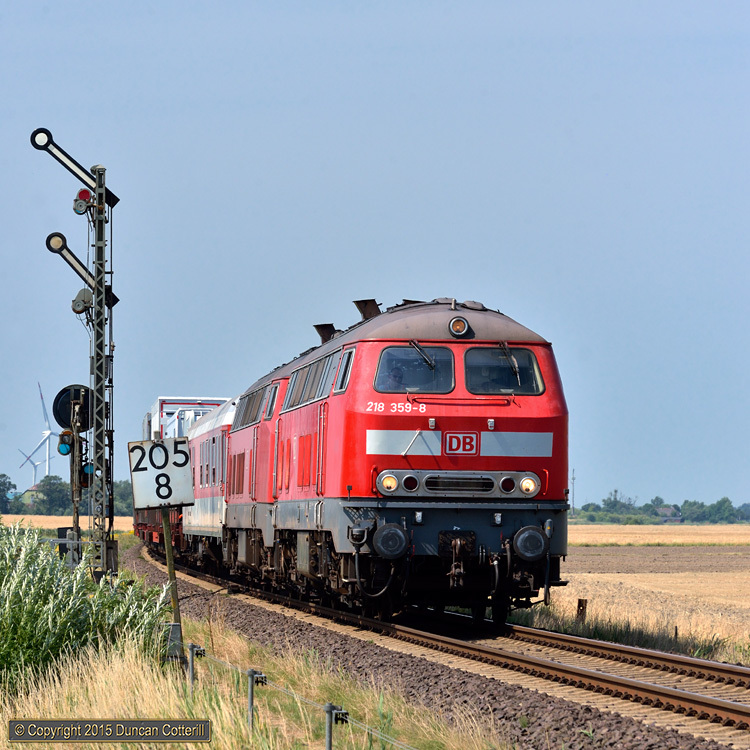 218.359 and 218.341 passed the semaphore signal guarding the approach to Lehnshallig loop, between Klanxbüll and Niebüll, with an eastbound car-shuttle on 19 July 2014. The top arm at 45 degrees gives the train permission to pass the signal, while the lower arm at 45 degrees indicates that a diverging route has been set, in this case into the loop. The black disk lower down is a distant signal in the on position as the signal at the far end of the loop is also on. Had the train been given a clear road through to Niebüll on the main, the lower of the two semaphore arms would have been in the vertical position and the distant rotated through 90 degrees vertically, so the edge rather than the face of the disk would have been visible.